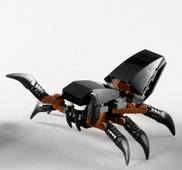 The Lego brand of toys has expanded their products to everything from Ninjas (Ninjagos) to movies like Harry Potter and books like the Hobbit. 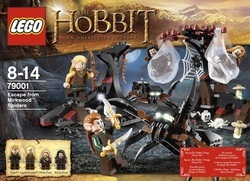 The Lego The Hobbit Escape from Mirkwood Spiders set brings to life the classic scene where Bilbo and his friends venture into the spider's lair. To see if this toy might be the perfect addition to your collection or a great gift idea, read what other purchasers had to say below. 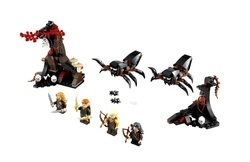 The Lego The Hobbit Escape from Mirkwood Spiders has a smaller number of pieces making it easier for children to build the model with little or no adult intervention. All the parts, pieces and details were well made and designed even though it varies slightly from The Hobbit book's account. There are four figures that come in the box, but Bilbo Baggins is not one of them, making the storyline a little inaccurate. All of the figures come with weapons and the spider web trees come with webs where you can actually trap the figures inside, just like in the book. One of the most interesting parts of the Lego The Hobbit Escape from Mirkwood Spiders are the glow in the dark pieces and accents. Not all of the pieces glow, but those that do truly add a nice hint of fantasy to the set. There were not very many complaints about the quality of the product or the fun factor. A few people mentioned, as above, that the set did not completely coincide with how the scene plays out in the book, but most children would not notice or know the difference anyway. Others mention that for the price of the set, there should have been more pieces to it. 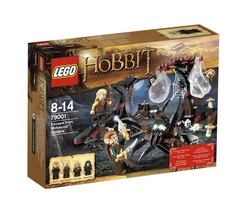 If you are just looking for a fun toy for your child, and are not worried about the accuracy of the set compared to the book, this would be a great starter set for any kid or addition to any fan's Hobbit story collection.